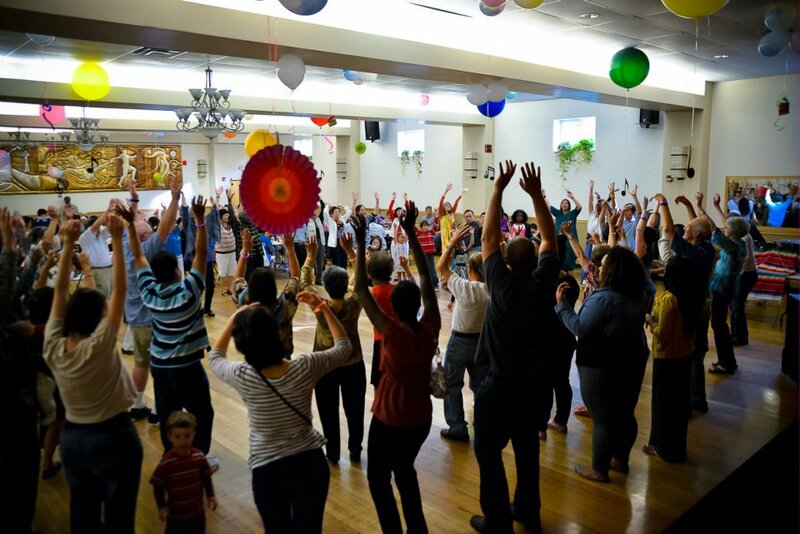 The World Dance Party is a fun party that welcomes all people to enjoy a potluck meal and free dance mini-lessons. There’s no secret agenda, just a desire to get people to interact and celebrate culture and diversity. If you haven’t come to a World Dance Party event before, here are 12 reasons why you should clear your calendar for the next one. Don’t miss out! The next World Dance Party is on August 15 at the Rainier Valley Heritage Parade and Festival in Columbia City. If you can’t make it to this one, be sure to join the World Dance Party community on Facebook to be notified of upcoming events. WDP Needs Your Support to GiveBig on 5/5!! World Dance Party (WDP) has been bringing folks together to share food, dance, music, and culture around Seattle since 2010. At many of our events, we hear people say that WDP’s are the most fun you can have for free. Well thanks, that’s sweet of you to say! We are able to keep our dance parties free and open to anyone because we have an incredible community of supporters that loves these events as much as we do. Our Planning Committee keeps costs low by partnering with organizations that host us at discounted rates, recruiting volunteers to teach dances, and asking everyone in attendance to bring food for the potluck or help out in some way. We cannot create these fun, lively, and inclusive gatherings without you all! Not only do we throw sweet dance parties, but we also provide assistance to others who want to create their own events where they live. We believe that each community can and should be celebrating like us. Check out our WDP Toolkit on this site. Chances are you’ve never given a donation to WDP to help us continue spreading the love around the Seattle area- we’ve never asked. This year, we decided to participate in The Seattle Foundation’s GiveBig event and reach out to our supporters to raise at least $2500- approximately the amount of money we’ll need to pull off the next 3 WDP’s! *You can donate to our organization at any time through our profile on The Seattle Foundation website, but your money will be stretched ONLY on May 5 for GiveBig. Thank you so, so much for your continued support of WDP. Please ask friends, family, or neighbors to match your donation and help us continue to organize these events for another year! High Fives All Around! We had incredible support from the Rainier Beach community and the amazing staff and students at Rainier Beach High School who helped us plan the event. Students volunteered to emcee, teach dances, shoot photo/video, and take on responsibility of set-up and cleanup. They were incredible! 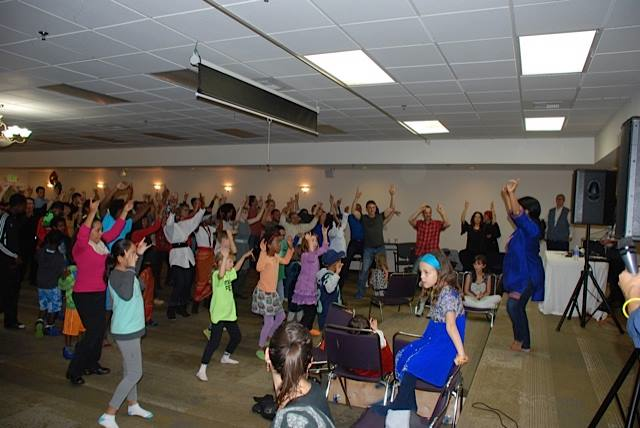 We had about 300 people attend the event to share some delicious meals and test out some new dances: West African, Persian, Iranian, Somali, Zumba, the Slide, Bachata, Oromo, Japanese, Hip Hop, and Arabic styles. Shout out to our DJ and volunteer dance instructors- you all brought your A-game! -WDP 13: When and where will it be? Do you have ideas? Share them with us! The World Dance Party 12 is just 3 days away! We are all excited and hope that you are too. Hopefully all of you will be able to join us this Saturday. Don’t forget to spread the word about the World Dance Party to your family and friends, the more the merrier. Don’t forget to bring a scrumptious dish for the potluck buffet with you. Many thanks to those who have helped us organize this event and that have volunteered to teach us fabulous dances. Get ready…TO DANCE! Looking forward to seeing you all there! It’s beginning to look a lot like spring in Southeast Seattle! We do hope you’ve all been enjoying this warmer weather. We’re gearing up for what is going to be an amazing World Dance Party on March 21st, 2015. This particular World Dance Party is quite unique for us. Why? 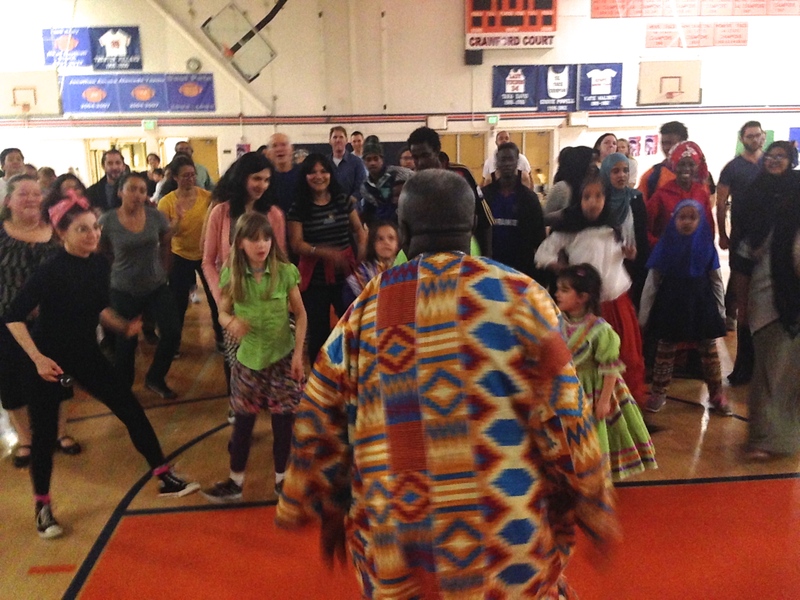 Well, we’ve partnered with a group of students from Rainier Beach High School to plan World Dance Party 12. They have been working hard making posters/decorations for the event, sharing their ideas, volunteering to take pictures at the event, spreading the word on social media, and you may even see a couple of these students teaching dances. They have been absolutely awesome and a pleasure to work with. Many thanks to staff and students at Rainier Beach High School for being willing to partner! 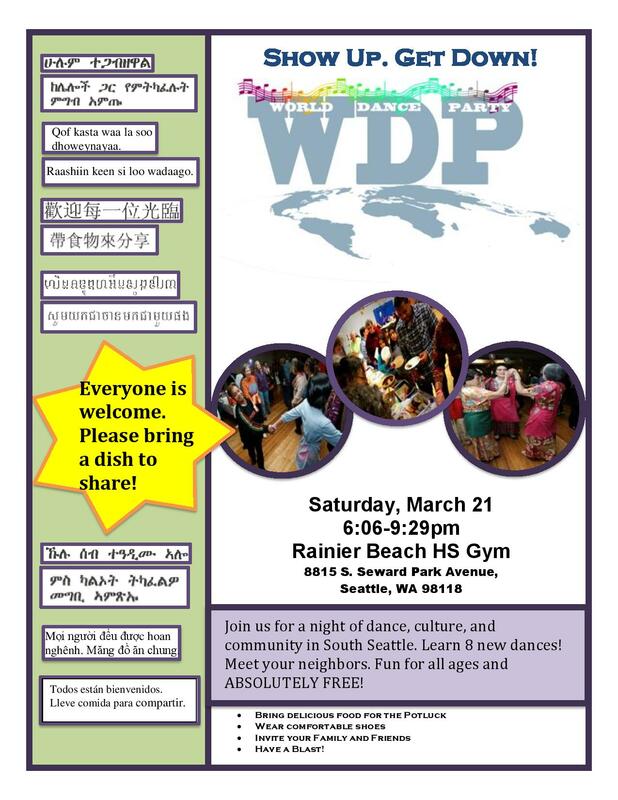 WDP 12 will be a fun-filled event with many dances to learn, delicious food to try at our potluck, and some icebreakers to participate get people interacting. 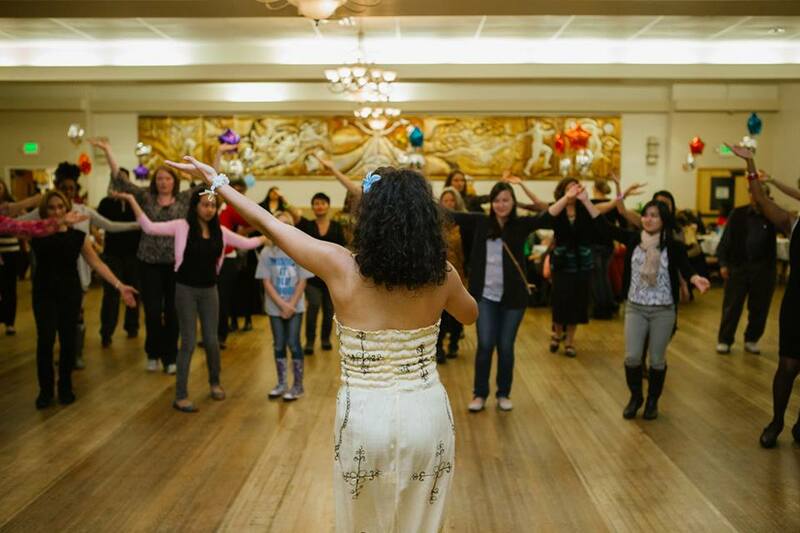 Some of the dances that you will see at the World Dance Party are: Mexican Folk Dance, Hip Hop, Japanese, Zumba, West African Dance, and Central Area Sliders. Spread the word to your community networks about this fabulous event. Feel free to check us out on Facebook. We hope to see all of you there.